Happy birthday T.J.! (Today is my brother's 27th birthday.) Sixth grade classes went well today. My co-teacher told me that my landlady had called her this weekend. She'd wanted to get into my apartment to hook up the new internet, so maybe that will happen after school today. After lunch my co-teachers started emptying those new cupboards from the art room that had to be put here last week, so we'd filled them with stuff. Some of it went on the shelf behind my desk (that we'd emptied into the art cupboards last week), and the rest went on the shelves in the classroom that we had also emptied last week. I just don't understand. A highlight today was getting my May timesheet completely signed off in one afternoon by my co-teacher, head teacher, Vice Principal, and Principal, which is always a huge inconvenience. A triumph! 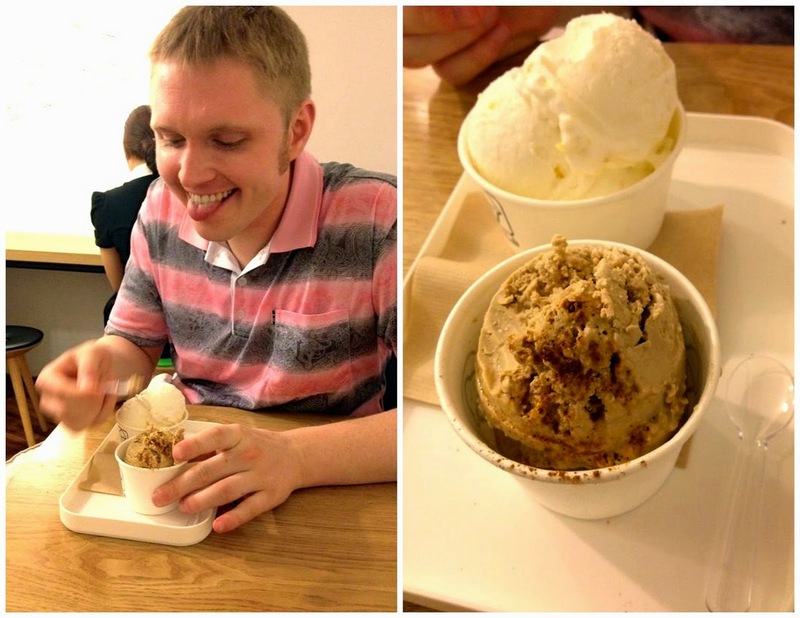 John went into Seoul while I was at work and walked around the Dongdaemun shopping district. 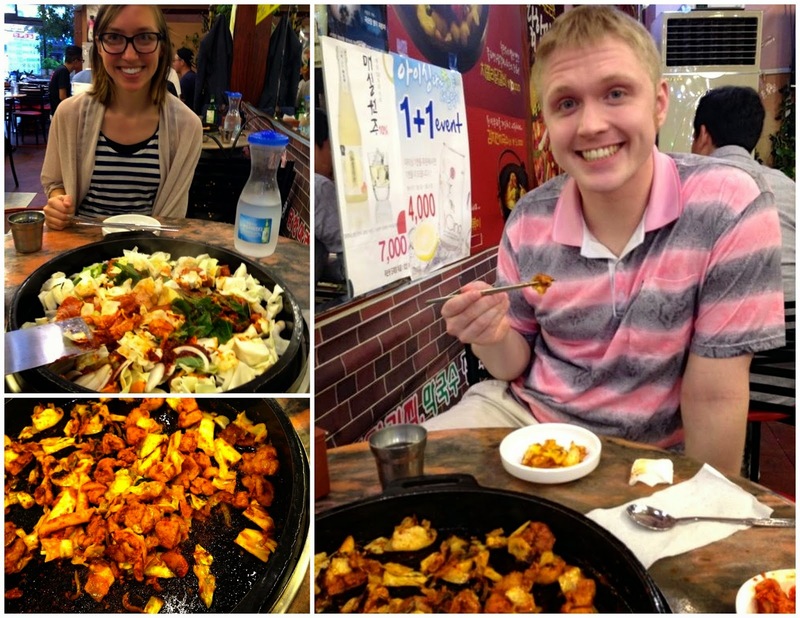 We got Korean barbecue dinner at a place near my home that I'd never been to before, and it was a success! The owners/waiters were so kind and helpful, doing lots of gestures to make sure we didn't eat the super hot green peppers, and that we did eat the melon she'd brought us. 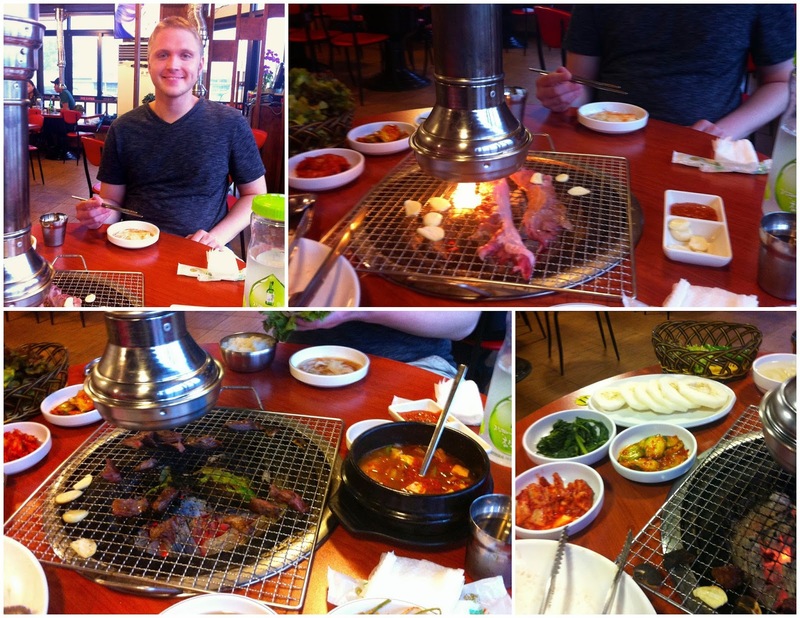 John enjoyed grilling the meat ourselves right there at our table, which is how Korean barbecue is done. Today the VP and Principal came in during one of our classes again and walked around back where the "office" part of the classroom now is. They were only there for a minute or two, talking with my co-teacher while I was with the class, and then they left. That afternoon two men came and took out those two big cabinets that had been moved in last week from the art room. Lots of wasted time, I don't understand. My co-teacher and I discussed our Open Class some more in the afternoon. I think we're trying to squeeze way too much into the 40 minutes, but maybe we'll be able to test it out on the other three classes first that day. John went into Bundang today, and then came and met me at school at the end of the day to take a quick peek around there. We spent the evening playing a competitive game of Spit (the card game), during which an internet service guy came to my apartment to change my internet. Later my Korean friend picked us up for dinner: shabu shabu round three! John wanted to have the shabu shabu from my town again, since it's so delicious, so we suggested it and went there. After packing up some, we went out and brought back a late dinner of ddeokbokki and a spicy beef soup with rice. John's last night in my apartment. What a strange start to my day. My co-teacher had to unlock the English room for me because my other co-t YH wasn't here yet, and I don't have a key. The classroom computer was doing these automatic updates when I turned it on ten minutes before class, so I couldn't use it. My co-teacher YH was nowhere in sight when the bell rang. I started class without him, thinking he'd be a few minutes late. The computer was out of commission the whole class period, so I had to improvise while trying to keep these younger kids focused on my own. It was very weird that he hadn't messaged or that no one had told me anything, as a co-teacher has never been absent before. I texted him "Are you coming late today?" during the break, and he responded a brief "No, not coming today. On Monday." Hmm, okay. The bell rang for second period to start, but I didn't have any kids in the room. Maybe something happened and the next classes wouldn't come because he wasn't here. Then my other co-teacher came in and said YH had to take his wife to the doctor, so he wouldn't be here today. She apologized that I didn't know ahead of time. She also told me the kids had something special for Earth Day during second and third periods, so I wouldn't have a class again until fourth period. Fourth period is our best class (they'll be our Open Class in two weeks), so I wasn't worried at all. I prepared for fourth period, the bell rang, and no students were there. I waited a few more minutes before messaging that class's homeroom teacher (because I knew he speaks English). He messaged back that since my co-teacher was gone today, he was confused and thought we didn't have class. After a few more messages he told me just to rest this period, which was already 15 minutes over by now. My other co-teacher came in, inquired about where my fourth period class was, and then told me some sad news about my other co-teacher, which explained his absence today. We were up at 7am for John to get to the airport on time for his 11:40 flight. I went along to the airport railway, and then headed back to the hostel for a little more sleep as John made his way to the airport. 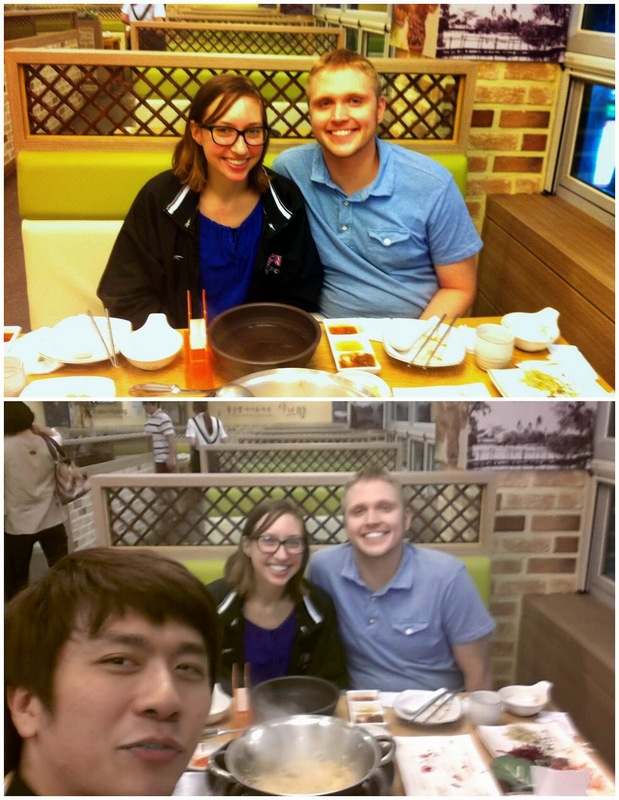 At noon I met up with Abby and Anne in Hongdae and checked into a different hostel for the night. We then spent the afternoon waiting in line to get LG Twins baseball tickets, which started at 17:00. It's been a long time since I've been to a baseball game, so I didn't have much to compare it to, but I guess the outfield was much shorter than the Brewer's stadium. (We got outfield tickets for ~$8 each, all other seats were sold out). We walked around Hongdae for a bit after the game (22:00? ), but I was wiped and there was no second wind in me, so off to bed I soon went.